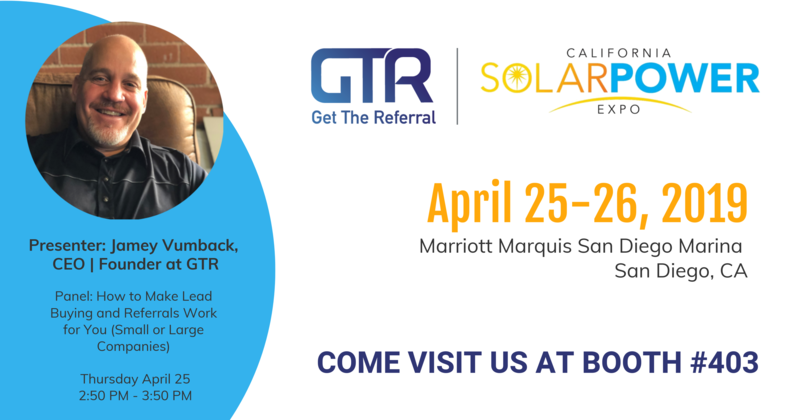 GetTheReferral (GTR) will exhibit at the California Solar Power Expo, in San Diego. The Expo now features two days of education specifically targeted at the California solar, energy storage, home building, and emerging renewable markets, hands-on product demonstrations from vendors, and unparalleled networking opportunities. Our CEO Jamey Vumback will be one of the presenters in the panel "How to Make Lead Buying and Referrals Work for You (Small and Large Companies)" and our sales team will be at booth #403 demonstrating our referral software. Come visit us! To get free tickets to the Expo, click here. GTR and Safe Haven: Building a Referral Network!